If you’re trying to locate a place to buy your favorite beer, no site is as comprehensive as BeerMenus.com. Back in 2008, the company envisioned a place where bars and stores could upload their beer selections, providing an easily searchable database for beer lovers. Now, the brand has just released their first iPhone app (Android version hopefully coming soon) and it includes some pretty awesome features that go above and beyond their basic website. The app still has all of BeerMenu’s most important features: the ability to search for specific beers and browse beer menus from bars around the country. But what makes the app particularly exciting is its ability to use notifications. 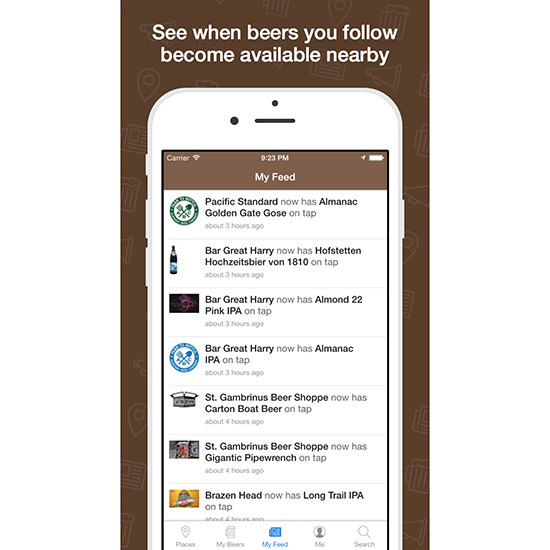 Users can follow specific beers to get notified when they become available nearby. You can also follow specific places to get notified when they change their selection. In the past, you could follow beers on the website and get this info via email, but the ability to get pinged every time your favorite beer goes live nearby, cutting out the email middleman, is just that much more alluring. Imagine getting a push notification the instant Pliny the Younger goes on tap at your favorite beer bar down the street. If you have a beer you love to drink on tap, the new BeerMenus app can let you know whenever it’s become available near you. And with top-flight beer bars changing their menus so frequently, getting notified with new lineups is also a pretty nice way to know what’s going on at the best beer spots around you. Granted, the app’s (and the site’s) fatal flaw always has been and always will be that for it to work at its best, bars have to use BeerMenus to actually regularly update their beer listings. But hopefully if BeerMenus continues to offer more cool features like these, more and more bars and beer stores will take advantage of the site’s possibilities.